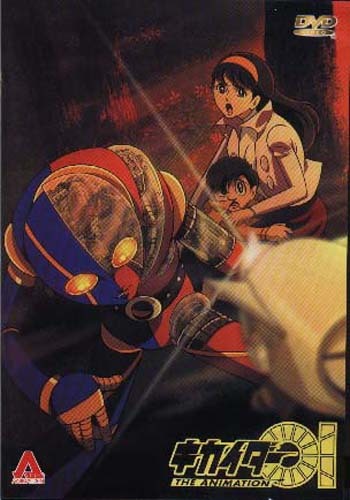 The Film: Jiro / Kikaider becomes the protector of a woman and child, Reiko and Akira, who are being pursued by DARK. Akira is the young son of DARK leader Professor Gill, and Reiko is his guardian. 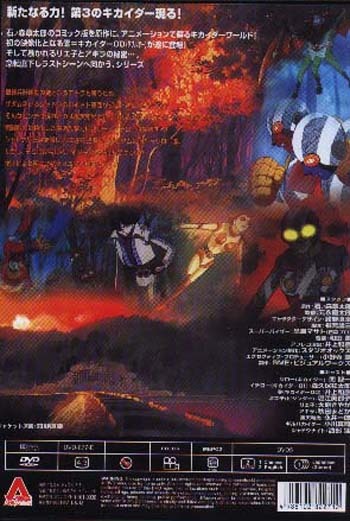 DARK is developing the Armageddon robot (a giant robot resembling Toho’s Moguera) for world conquest. They need Akira because his unique brainwaves can power / guide the robot. Kikaider 00 ("double-oh"), a powerful battle android built by Futen. Episode 1: Kikaider struggles to keep Akira and Reiko (misidentified as “Ming” and “Mitsuko” in the Engrish subtitles) safe from the relentless robots of DARK. He discovers his brother Kikaider 01 hidden away in a temple. Episode 2: Jiro and Ichiro are attacked by the female android Bjinder. They then have to deal with the revitalized Hakaider and three other Hakaider-type android assassins! Episode 3: The ranks of the good androids are bolstered by the addition of Kikaider 00. DARK lures Reiko into a trap at her childhood home, where a devastating secret is revealed. Episode 4: With Akira powering their giant robot, DARK begins a campaign of destruction. The final battle against DARK is one Kikaider will have to fight alone! Extras / Menus: There is an art gallery containing 24 images of conceptual artwork and character designs. There is also a storyboard-to-scene comparison covers four sequences. A scene from the film is shown side-by-side with the storyboard sketches. This allows the viewer to get an idea of how scenes are visualized before being animated. Though not very extensive, these extras are certainly worthwhile additions.